The ecom-CL 2 – the perfect combination of wall positioned and floor standing instrument. It is an easy to use gas analyzer designed for commercial combustion monitoring in a variety of applications. The ecom-CL 2 is fitted with up to 3 gas sensors, measuring O2, CO & NO, plus STACK and AMBIENT temperatures, and STACK Pressure and Draft. 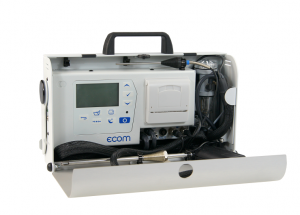 The ecom-CL 2 also calculates CO2, Efficiency, Losses, Excess Air and Oxygen correction 0-20%. The on-board computer has 5 pre-programmed fuel types and can store up to 16. The ecom-CL 2 sample conditioning system consists of a high flow pump and radiant gas cooler with condensate trap. An automatic shut-off activates when the condensate trap reaches its maximum capacity. Another unique feature of the ecom-CL 2 is an automatic and manual CO bypass function which protects the CO sensor from over exposure.